In a soccer match in Russia on Sunday, a bear named Tima was led to the stadium named Mashuk-KMV Pyatigorsk club’s stadium where the match was happening. He even handed over the ball to the referee. Even the announcer said that Tima will participate in the World Cup’s opening ceremony in Moscow which is scheduled in June. However, authorities have not confirmed the match. The club’s Manager said that the bear was borrowed from a nearby circus. However, the The New York-based World Animal Protection group have condemned the act and said that “cruel training methods have been used” on the bear. 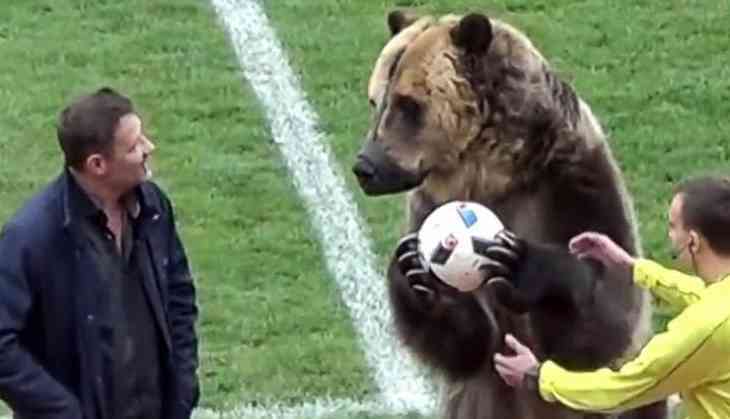 In the video, the bear is seen clapping and handing over the ball to the referee before a game. Even the animal seemed to be puzzled and distressed while standing in the middle of the field. He was even muzzled with a black strap as he was seen performing tricks. This video was captured in Russian Professional Football League. Director of PETA, UK, Elisa Allen, said, "A bear performing during a game is an inhuman act." Video the animal performing has gone viral and has received a lot of criticism from social media. People are calling the act "sickening" and blasting the Russian soccer club.